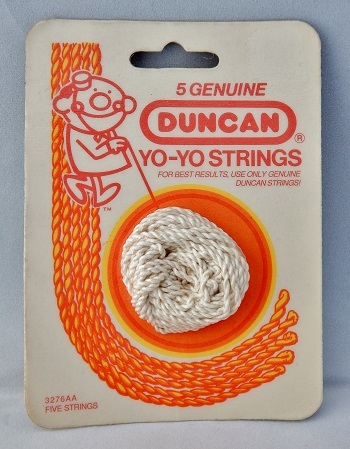 One of the yo-yo string pack standards from the late 1980s. Duncan cotton strings have remained a yo-yo standard for more than 80 years; only the packaging, price, and quantity has changed over the years. The Duncan Yo-Yo man depicted on the front of the packaging was a staple character used on many Duncan products since the 1960s. By the 1990s, however, his appearance underwent a considerable makeover to make him appear more hip and cool. See Duncan 5 strings (1994). See also this string pack in the Duncan 1989 Toys Catalog.